Ballymena led 2-0 at the break, their front two proving the difference between two otherwise evenly matched teams. That man Friel won the penalty for the opener - skipping inside Fra Brennan and getting a trip. Kane converted and Friel did similar three minutes later - a tap in after superb work from his partner in crime Johnny McMurray. Ards’ David McAllister made it 2-1 on 49 but just two minutes later, Friel restored the two goal advantage, nodding over Glendinning after a gift from the Ards back line. Friel doesn’t need asked twice and when he sprung clear of the defence on 84, he rounded the keeper to convert his hat-trick goal. 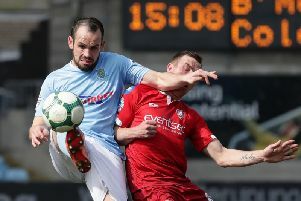 Even Craig McMillen’s injury time goal couldn’t take the shine off a superb day for Ballymena and talisman Cathair Friel. ARDS: Hogg, Brennan, Friars, Taylor, Ruddy, McCullough, Tommons, McMillen, McKinney, McAllister, Douglas. Subs: Cherry (Brennan 46), Liggett (Tommons 71), McMullan, Hall, McComb (McAllister 65). BALLYMENA: Glendinning, Owens, Flynn, Gage, Wallace, Ervin, Jenkins, Faulkner, Kane, Friel, McMurray. Subs: Henderson, Kane, Loughran, McAuley, McCracken.